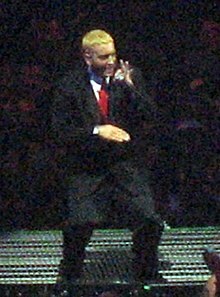 Marshall Brussius Mathers III (natus Marshall Bruce Mathers III Sancti Iosephi Missuriae 17 Octobris 1972), professionaliter Eminem notus (saepe EMINƎM stylizatus), est rapper, compositor carminum, phonodiscorum productor administratorque, et histrio Americanus. Vicimedia Communia plura habent quae ad Eminem spectant. Novissima mutatio die 21 Februarii 2019 hora 13:25 facta.